Recently I found a cute pair of almost new, black leather sandals at one of my favorite thrift stores. With continued internal rejoicing, I decided to don yon black sandals last Friday when I took Sarah to our meeting place with Victoria's mom. Once the Great Daughter Hand Off was accomplished, I turned the car around and headed back home, planning to stop for a few minutes at my favorite consignment store on the way. After I had spent about an hour (and five dollars) in the store, I headed out to the car. As I walked along, I noticed that my shoes felt sort of . . . funny. Not ha ha funny, but funny, funny. I had been noticing throughout the day a gathering pile of little black clumps on the light colored floor mats in the car but I just thought I had tracked in some dirt. However, as I sat down in the seat of the car and pulled off my sandals, I saw a most disturbing sight. Warning: These might just be the scariest shoe pictures you have ever seen so please, proceed with caution. Pregnant ladies and children are advised to steer clear altogether. 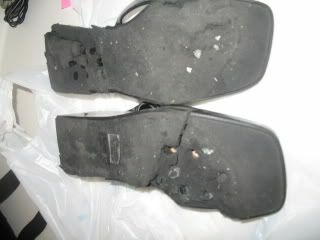 That is what my almost new shoes looked like! In less than hour, they had been eaten away! They had disintegrated! I could fold in half what used to be a thick, sturdy sole! I sat in the middle of that parking lot and I pondered. I pondered what could possibly have caused my shoes to just dissipate into thin air like that. What could be behind this malevolent mystery? Finally, the truth dawned. The light came on. I received a clear answer to The Question. The sandals were obviously being eaten alive! They were defenseless little fellas that had trusted me (their new owner) to help them and to defend them and I had failed. Right before my eyes, I was seeing scary, alien, sandal-eating microbes at work, microbes that had infiltrated the earth from The Planet Shooz and had come here for the express purpose of munching on my fabulous footwear. I mean, what other explanation could there possibly be? For the rest of my journey home, I kept on glancing worriedly down at my sandals. I thought, "Any minute now, those microbes will get finished with the sandals and they will start eating their way into the bottom of my foot. I am going to arrive at home with both feet missing and will have to call Steve on my cell phone to have him come out to the car and help me inside. And then I am going to have to explain to him about the scary, alien, sandal-eating microbes. And he won't believe me. And he'll think I'm just a little, teensy, tad bit crazy. And he'll silently blame my hysteria on PMS. Or peri-menopause. Or some other mysterious 'makes a woman crazy' condition." As my wild imagination continued to run amok, I was fully convinced that my feet were starting to feel a bit warm and kind of prickly. I could just picture the little microbe thingies getting closer and closer to my very own personal foot flesh. It was not a happy trip. Even though, theoretically, I knew that I was in no immediate danger, I must say that it is highly alarming to have shoes that you are currently wearing begin to disintegrate for absolutely no reason. And what could be more normal (in my mind, at least) for one's thoughts to turn to scary, alien, shoe-eating microbes? When I got home, I ran into the house (thankfully, my feet were still intact) shoved the shoes into Steve's face and shrieked, "Do you want to see something really, really strange?" He put on his patient husband voice and said patient husband words to me as he carefully examined the microbe-devoured, newly destroyed, almost new sandals. And then he finally came forth with his masculine opinion. "Dear," he intoned, "The only thing I can think of is that maybe those sandals were stored in a hot attic and the shoe materials started breaking down in the heat. When you started wearing them, they just couldn't hold up." I know he was trying to be all comforting and technical and everything but personally, no one is ever going to convince me otherwise. It was scary, alien, sandal-eating microbes that were at work. Well, except that I should also add that I feel fortunate to have escaped with my feet still intact. And in other news . . . .
that's an interesting attic theory... yesterday I took a Pen Pal and her friends to the Zoo, and my imitation-crocs started rubbing on my foot. I noticed that it had a little bump on the edge, and I thought maybe the heat had sorta molded it into a different shape. Fortunately, a simple THIN bandaid stopped the hurt and prevented a blister..which I thought was rather fascinating in itself. wish a bandaid could help your back, Becky. 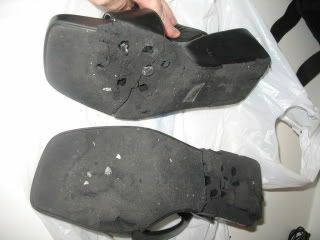 Akin to the human flesh eating disease, your shoes clearly were the victim of the dreaded rubber/foam eating disease. It is very rare (your luck) and can be very dangerous. 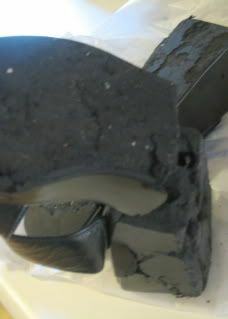 Resistant to most forms of anti-poly-resin-biotics, this rubber/foam disease can destroy the molecular make-up of a pair of shoes within seconds. Your shoes came dangerously close to disintegrating into oblivion on the floorboard of your van! Imagine being pulled over by a local police person for driving without shoes and the horrified look on his/her face when you explain the dire situation. To ward off subsequent outbreaks of the dreaded rubber/foam eating shoe disease, please carry a full set of infectious disease preventing garb in your car for each member of your family: rubber gloves, sterile gown and mask, as well as those lovely little disposable shoe coverings. This is the only way to prevent the spread of this insidious disease BEFORE it spreads to the rubber mats in your car! First the shoes. Then the floor mats. Then the tires! (Thus giving new meaning to the phrase "where the rubber meets the road.") Resist the urge to be cavalier about this. It is serious and must be treated as such. The potential to destroy ever single pair of shoes in your household is very, very real. Hey, something similar happened to my husband Thomas once. We were living across the country when my wonderful daddy died, so we packed a few clothes and flew "home" to Mississippi. The next day we dressed up and went to the funeral home for visitation. Poor Thomas! His shoe soles were breaking off in big chunks and he was leaving a trail on the floor behind him whenever he walked across the room. While we were grieving the loss of my dear daddy, we were also rejoicing that he was in heaven with Jesus and no longer suffering from the cancer he had fought so long. Thomas's shoe saga gave us quite a chuckle at a stressful time. My dad had a great sense of humor and we just KNEW he would've gotten a kick out of that situation. Thomas had to go to a 24-hour WalMart late that night to buy new shoes so he'd have some to wear to the funeral the next day. By the way, Thomas had only worn his suit and that pair of shoes once in the 12 years since we got married (he is a jeans & flannel shirt kind of guy), so I guess old age and un-use will make them disintegrate as well. Or maybe it was those scary, alien, shoe-eating microbes... God bless. Oh, Becky. I bought a pair of perfect black sandals similar to yours at Salv Army. I loved them the moment I saw them and they fit me perfectly. Two inch heels and comfortable! Wore them all the time for a week, when it rained torrents. Got soaked and stepped in some puddle. Came home and took off the sandals. Noticed black smudge marks on kitchen floor. Started stalking the marks, suspecting the dog or cats or kids. Until I realized that it was me, or rather, my feet. The black from the sandal bled and the bottoms of my feet were coal black! Still love those sandals and wish I could find something just like them that don't bleed. Thank you...thank you...for helping me laugh this morning! What a welcome gift! I've also enjoyed all the comments. I've been overwhelmed x 3 for about two weeks...and can't see the end of it...but reading this story gave me a much needed laughter break. More...give me more!